On a couple of our earlier bus rides, we noticed this striking church and made a note to visit it sometime. Yesterday, we did. 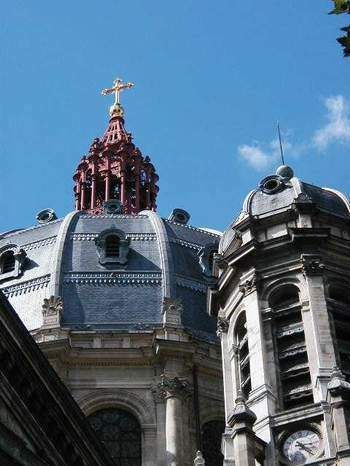 It is St. Augustin, designed by an architect named Baltard between 1860 and 1871, and it is important partly because it is the first ecclesiastical building made with a metal infra-structure covered in stone. 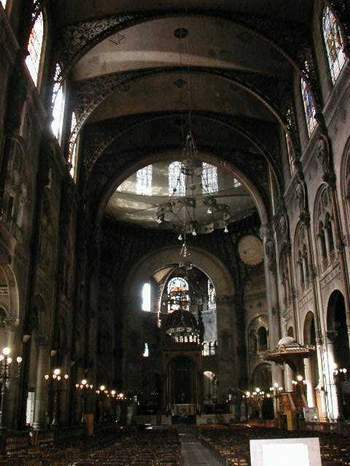 This allowed for Gothic proportions (although the church has many Byzantine design elements) without buttressing. So it fits nicely in this wedge-shaped lot in one of those impossibly complicated Paris intersections of 5 or 6 streets. 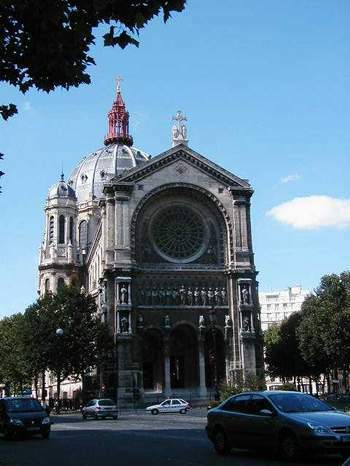 The church is not far from the St. Lazare train station. 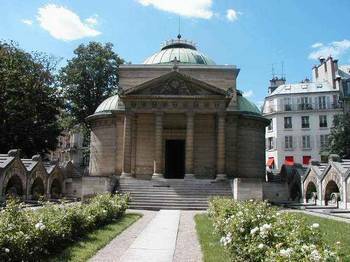 The church is also known for being the place where a man named Charles de Foucault re-discovered his faith. He had been a military man, and eventually became a priest who went to live with nomads in a remote part of Morocco. Rather than leave his nomad friends, he remained and was assassinated there in 1916. I'm not sure by whom -- perhaps by Muslim extremists? At any rate, it is clear from the display in the church that this humble man was much loved, both by his nomad friends and his those who knew him in Paris. 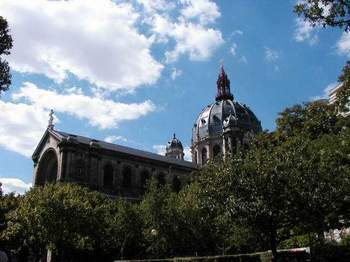 At right is a view of the top of St. Augustin, taken from across the street in one of those common and lovely parks that one finds throughout Paris, even in busy neighborhoods like this. The area is busy not just because of the train station, but also because the great department stores are nearby on Boulevard Haussmann. The top of the dome on St. Augustin is especially striking. 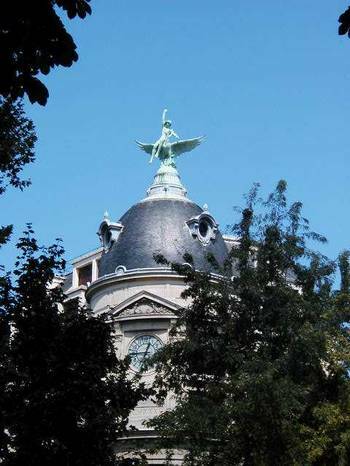 The picture below it shows a dome on a more recent, Haussmannian building nearby. Perhaps it was inspired by St. Augustin's dome. 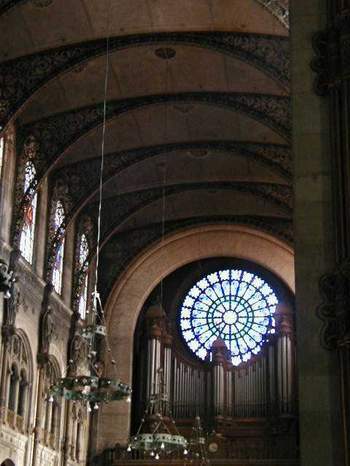 Napoleon III decided to build St. Augustin, which was consecrated in 1879. 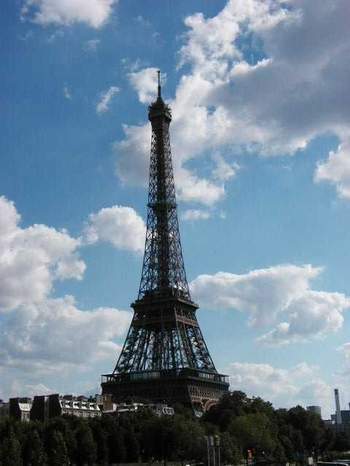 It is 100 meters high. Apartment building near St. Augustin. Here you can see the metal infrastructure of the church. Sorry about the blurring, but I don't like to use flashes in churches. Very bad taste -- and if any of you do it, shame on you. The filigree arches, as well as the decorative metal columns that follow them down to the floor, are metal. 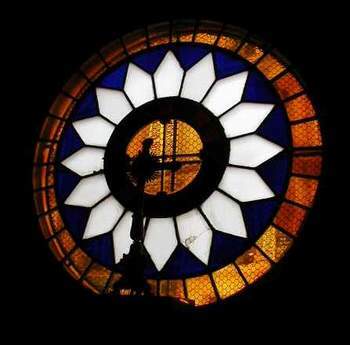 The rose window actually had a lot of that really intense blue glass that does not show up here. Again, sorry for the blurriness, but I used no flash. 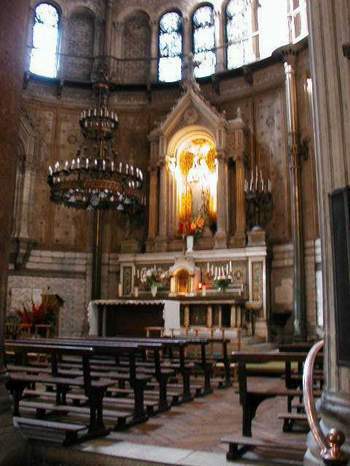 This is the altar in St. Augustin. Not far from St. Augustin's is a park called Square Louis XVI. In it is this chapel called Expiatoire. 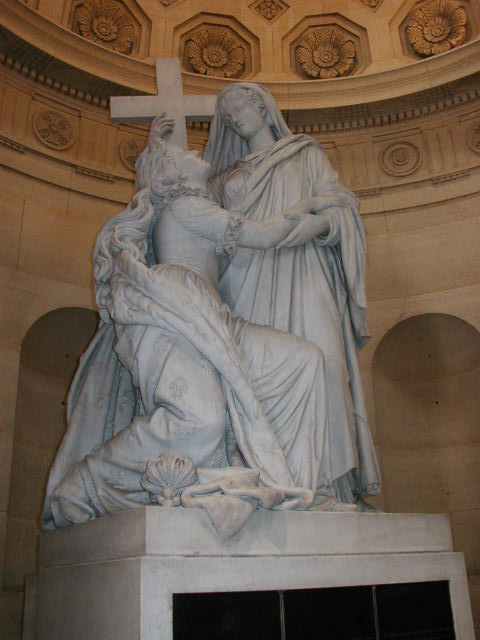 It was created in 1815 by Louis XVIII on the site of the cemetery where Louis XVI and Marie Antoinette were buried in 1793 (although their remains were later moved to the royal necropolis at St. Denis). Also buried here were the Swiss Guards who were killed at the Tuileries in August 1792, and many of the victims of the guillotine that stood on the Place de la Concorde. 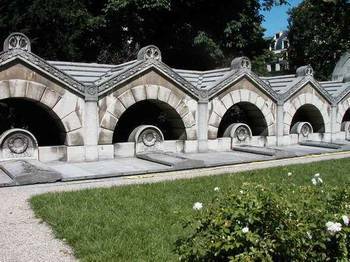 The tombs of Charlotte Corday, who stabbed Marat in his bath to avenge the Girondins, and Phillipe-Egalité are on either side of the steps leading to the chapel. Hundreds of people are buried here, so these tombstones that line the courtyard in front of the chapel are not marked. I think they just indicate different sections of the cemetery, and a list must be kept by the "surveillant" who works in the park. 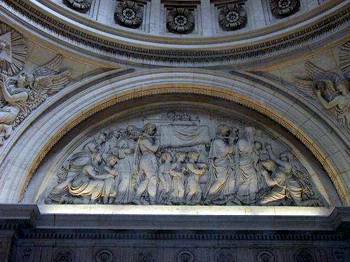 Inside the chapel is an elegant dome and this frieze depicting the transport of the body of an executed person to the cemetery. 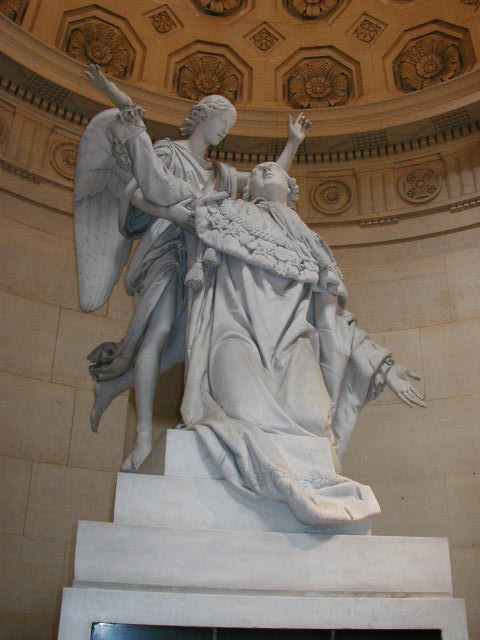 Two very moving statues are inside, under the dome of the chapel. This one shows Marie Antoinette, and the one below shows Louis XVI. On bronze plates on the front of the pedestal for each statue is etched a rather lengthy statement made by each of them before their executions. 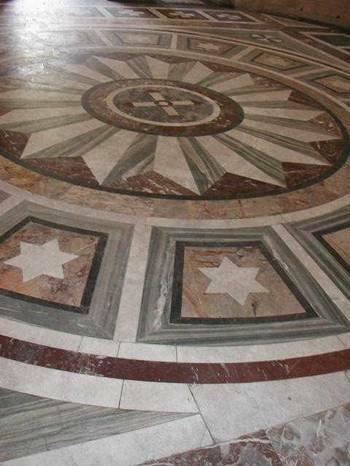 An ornate marble inlaid floor decorates the space between the statues. The lower level of the chapel contains a small, dark crypt with its own altar and stained glass window. Earlier in the day, we happened upon the stamp market. 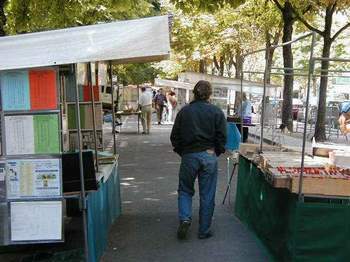 Paris has specialized markets in specific locations throughout the city. 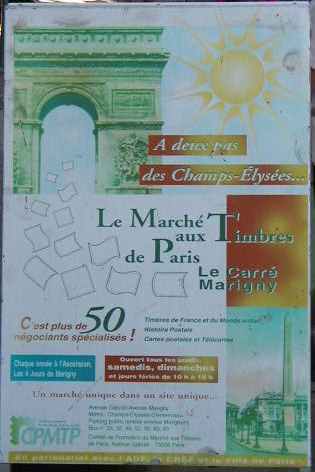 This one is north of the Champs Élysées, near Avenues Marigny and Matignon. It is open on Saturdays and Sundays. Mostly, we saw old postcards for sale there. Here's a sandwich-board sign about the stamp market. Not far away was this antiques store window. 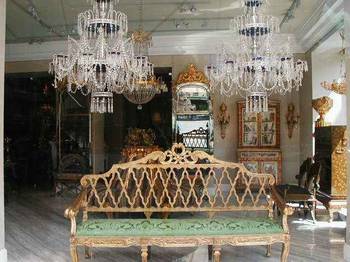 Tom and I are showing marvelous restraint in not spending money on antiques or oriental rugs, with a plethora of shops like this around us everywhere we go. 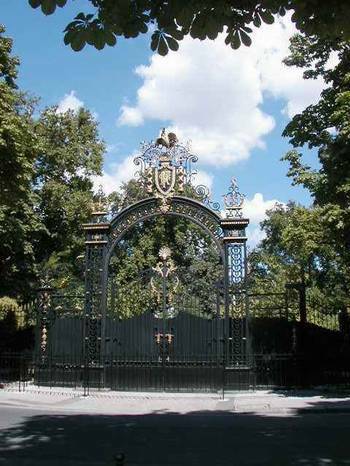 I haven't shown you many gates yet -- and these are such nice, emblematic features of Paris. This one marks the entrance for the Ministry of Home Affairs for France -- it was once the home of the Prince of Beauvau (1836). 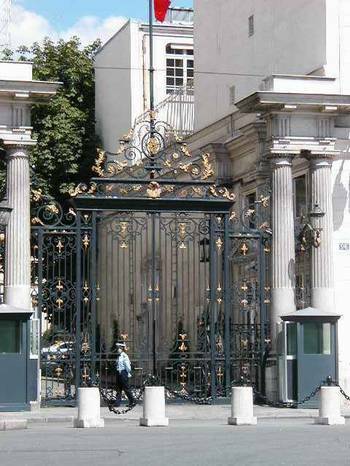 And this gate marks the entrance on the Champs Élysées side of the Palais de l'Élysées, the French equivalent of the White House. It is the home of President Chirac who is now away on vacation at his chateau. His chateau, by the way, he has protected from nearby development by arranging to have a charity purchase the land. He is the treasurer for that charity, the Georges Pompidou foundation. At first, he arranged for the charity to get a loan to pay for the land (even though the charity regularly suffers financial crises), and then he arranged for the charity to receive government funds so that it could pay off the loan. And no doubt you've been reading about how he finances his other travels -- that must be why he's staying quietly in his chateau for this "vacances." 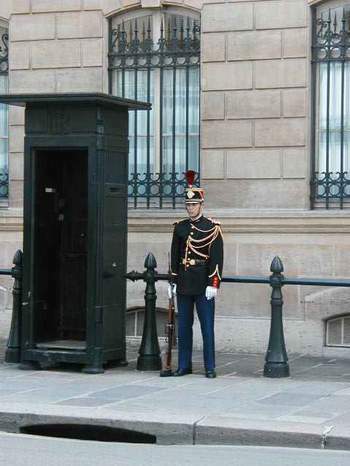 On the other side of the Palais, on rue Faubourg St. Honoré, a fancy armed guard keeps watch over the entrance. 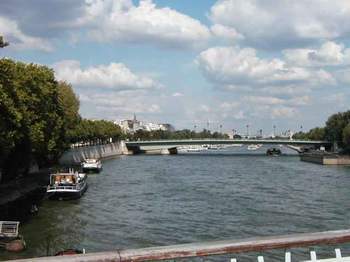 Another view of the Seine. 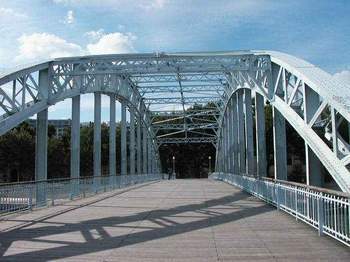 This one shows the most modern bridge, the Pont d'Alma, which lacks the graceful arches of the other bridges. Our favorite Passerelle (pedestrian bridge), de Billy, which carries us back home to the left bank after one of our walks along the right bank's temporary "Velorution Quay." "Velo" is for bicycle, and it is a play on Revolution. This is the term used for Georges Pompidou Way when it is closed to automobile traffic from July 15 to August 15. We recently learned that it is also closed to autos during many Sundays throughout the year. Just another lovely day near the Eiffel Tower.